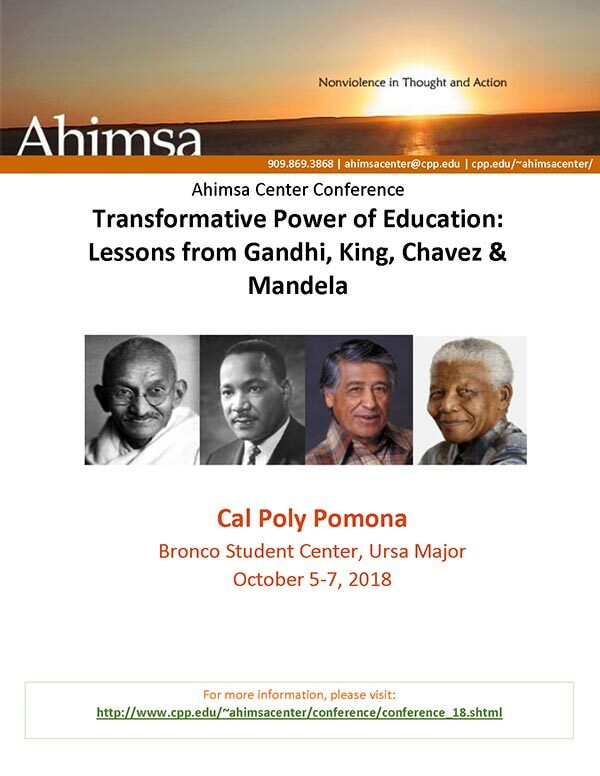 Please join us for Ahimsa Center’s 2018 conference, Transformative Power of Education: Lessons from Gandhi, King, Chavez and Mandela, October 5-7 (Friday-Sunday). The conference will begin at 1:00 p.m. on Friday, October 5 and conclude on Sunday, October 7 at 1:30 p.m. following lunch. There will also be a two-hour pre-conference workshop led by Civil Rights Icon, Dr. Bernard Lafayette on Friday, October 5 from 10 am-Noon. In addition to the distinguished speakers and selected panelists, this conference also features several educators--Ahimsa Fellows--who, following their training at the Center, have continued their work on nonviolence education and who will share their insights and experiences at the conference.